Atlantis House is a luxury retreat positioned on the Atlantic Ocean on Atlantic Boulevard in tropical Key West and is the only guesthouse along the beaches. It was voted, by the Mayors Committee, as â€œthe cleanest and greenest business in Key Westâ€ for January of 2001. Atlantis House was designed, built and maintained by the owners, Steve and Kayla Kessler, and offers amenities not normally found in hotels and guesthouses, making your stay that much more memorable at an affordable rate. Atlantis House is very private and exclusive consisting of the Master suite and the Garden suite, each with private entrances through French doors off of a 700 square foot sun deck. 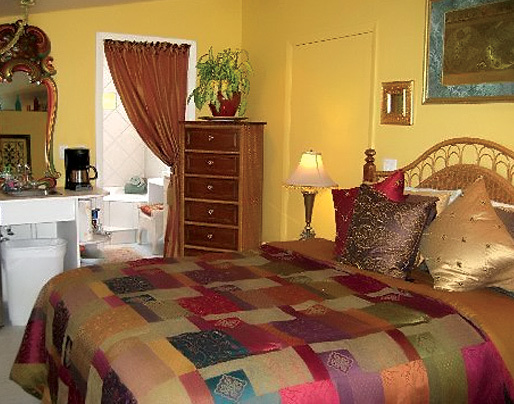 The Guest Suites are both located at ground level and completely separate from the main house. Both suites open out through French doors to a private 700 sq. ft. deck where you will find lounge chairs for sunning and outdoor tables and chairs for alfresco dining. The grounds are beautifully landscaped with exotic plant and coral rock gardens around a breezy little, vine covered gazebo. For your convenience, there is off street parking on the property. LOCATION AND OTHER POINTS OF INTEREST Atlantis House borders on a 10 acre indigenous park and wildlife preserve which is across from Rest Beach. Directly in front of Atlantis House, is a bike/walking path connecting the two most popular beaches in Key West, Smatherâ€™s and Higgâ€™s, which is busy daily with runners, rollerblades and strolling beachgoers. Atlantis House is only 40 yards from the Atlantic Ocean and is located in a quiet residential area. Yet is 5 minutes by car or scooter from the raucous downtown Duval Street, with all itâ€™s famous bars, restaurants, shops, entertainment and historic sites. Steve has a 23 ft. Contender and takes guests on private fishing and guided snorkeling tours at the only coral reef in the Continental United States. For couples with a sense of adventure and want to get away from it all, he offers private island adventure/eco tours out to secluded natural beaches where you can take a peaceful stroll or pass the time having a lunch and snorkeling for marine life and seashells. After your long hard day of play, we are pleased to offer the ultimate in relaxation; a tension relieving Swedish massage in the privacy of your room or on the private deck surrounded by lush tropical landscaping and bathed in cool island breezes. Kayla is a licensed massage therapist specializing in Swedish, hydro, neuromuscular and connective tissue therapies. One hour, ninety minute and two hour sessions are available. Please call in advance for appointment. Kayla and Steve are dedicated to making your stay as enjoyable as possible and are happy to make suggestions and arrangements for a myriad of island activities from casual to fine dining ideas, sunset catamaran sails, fishing trips, diving and water sports to private secluded island adventures to wile away the day while basking on a tropical sandy beach. So come find yourself again in the Keys at Atlantis House.